We’d love your help. 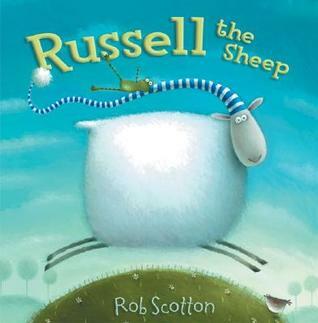 Let us know what’s wrong with this preview of Russell the Sheep by Rob Scotton. Sometimes Russell is just a little bit out of step with the rest of the flock. All the sheep are falling asleep -- except Russell. What's a sheep to do? Russell tries everything ... until, at last, he falls asleep. To ask other readers questions about Russell the Sheep, please sign up. 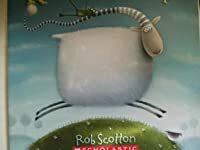 I have had mixed feelings about Rob Scotton's Splat the Cat books - sometimes I enjoy them, and sometimes I am indifferent - so I was curious to see what I would make of his other picture-book hero, the ovine Russell. I'm glad to say that I found him to be an appealing character, and that I enjoyed this initial story, in which Russel struggles to get to sleep, quite a bit! Russell tries everything, from changing his apparel to using his frog companion as a pillow, to get to sleep, but in the en I have had mixed feelings about Rob Scotton's Splat the Cat books - sometimes I enjoy them, and sometimes I am indifferent - so I was curious to see what I would make of his other picture-book hero, the ovine Russell. I'm glad to say that I found him to be an appealing character, and that I enjoyed this initial story, in which Russel struggles to get to sleep, quite a bit! Okay, I read a LOT of picture books. It's an occupational hazard. I rarely add them to my Goodreads list because I feel like it would unfairly influence my "must read at least 52 books per year" list. However, this is the week of my RTMLA "Bedtime" storytime, and I picked this book. And I'M IN LOVE. It worked so well as a read-aloud. The kids didn't wiggle, the parents giggled, and everyone liked helping me count the sheep. The drawings are detailed and funny and interesting. The kids could see Okay, I read a LOT of picture books. It's an occupational hazard. I rarely add them to my Goodreads list because I feel like it would unfairly influence my "must read at least 52 books per year" list. However, this is the week of my RTMLA "Bedtime" storytime, and I picked this book. And I'M IN LOVE. It worked so well as a read-aloud. The kids didn't wiggle, the parents giggled, and everyone liked helping me count the sheep. The drawings are detailed and funny and interesting. The kids could see the main action, but I was able to ask them a lot of questions about the details of the pictures. They laughed at the "frog" pillow, too - and liked pointing out the frog in the other illustrations. Recommended to Lisa by: Abigail A.
I didn’t have high expectations for this book because I wasn’t wild about the cover illustration. But, I ended up being pleasantly surprised. The illustrations are a hoot. They are so cute. A sheep with a teddy bear, one with dentures in a cup, one with a newspaper, and much more, and Russell’s companion on nearly every page, a frog. Most of the pages have much to view, and much of it is amusing. I also ended up liking the art style, at least in conjunction with the story. I love the blues and gr I didn’t have high expectations for this book because I wasn’t wild about the cover illustration. But, I ended up being pleasantly surprised. The illustrations are a hoot. They are so cute. A sheep with a teddy bear, one with dentures in a cup, one with a newspaper, and much more, and Russell’s companion on nearly every page, a frog. Most of the pages have much to view, and much of it is amusing. I also ended up liking the art style, at least in conjunction with the story. I love the blues and greens and other colors and the way they’re used. It’s enjoyable to look for everything shown on every page. The story is of Russell the sheep who cannot sleep. No, the story is not told in rhyme. Russell tries all sorts of things to try to fall asleep, and adults and children who know about the counting sheep technique will probably guess what’s coming. But, it’s still quite funny when that part comes. Russell is a very endearing character. And, as an almost lifelong insomniac, I was particularly tickled by this storyline. I enjoyed Russell and the frog character was a great inclusion. Adorable story with amazing illustrations! Russell the sheep has always been one of my favorite picture book series. In his first book he is trying to fall asleep. He tries sleeping in different locations, with different people, and then counting. But not even counting every star in the sky can help him get to sleep. The story is cute, and the illustrations are adorable making for a great picture book. My son and I both loved this book! The illustrations are well done and the prose simple and easy enough he can read it alone. There are plenty of giggles, and it seems every time we read it, he notices something new and silly to adore. I'm a huge fan of the author's art, I buy his books just for the (amazing) pictures! The story is nice too, with humorous touches, and the characters are really likable. Russell books are light in text, so they are better for young kids around 3yo. The story line is nice, but the illustrations are superb! Opening line/sentence: Russell the Sheep lived in Frogsbottom Field. Brief Book Summary: Russell the Sheep is having trouble getting to sleep one night, blaming everything from being too hot or cold to needing a frog for a pillow. Eventually, Russell decides to try counting his toes to the millions of stars and still cannot fall asleep. Ultimately, Russell decides to count sheep, which finally allows him to fall into a deep slumber. Response to Two Professional Reviews: While neither review seems too fond of or too against the book, I found it to be quite enjoyable. The Horn Books review says the story “doesn’t amount to much”, and while it is a simple story, the main aspect of this book is that it is a counting book, so I don’t feel as though the story needs to be much deeper. I agree with the Susie Wilde’s review on the book easing pre-sleep tension, making the book quite relatable as everyone has at some point struggled to fall asleep. Evaluation of Literary Elements: With the simplicity of this book, it is very believable and relatable for readers. Russell’s struggle is clear from the beginning, moves at a good pace, and ends with a satisfying conclusion. Russell is seen all over the field the book is set in, and although the story focuses on Russell, we see images of other animals that make his world more fleshed out. Consideration of Instructional Application: While I enjoyed reading this book quite a bit, I believe it has more place as a bedtime story than in a classroom. In a classroom, this story would be more ideal for younger kids so that the counting Russell does at the end could be the educational focus. If there was a lesson involving the topic of sleep this would be a good book to use, and it could be expanded upon by having children share their own experiences with sleeping and what helps them to fall asleep. 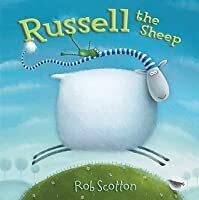 This book follows Russell the Sheep as he struggles to fall asleep! He goes around, trying to find more comfortable places to sleep, he tries to count things, such as his legs, other animals, and even the stars, but still he cannot seem to get to sleep. I don't foresee anyone having any potential problems with this book. Does not really cover any sensitive issues. Russell the Sheep has a hard time falling asleep. He tried all sorts of methods, like covering his eyes, taking off his fur and then putting it back on. He tried different places to rest but none of his efforts seemed to work. However, there is one classic method that can put anyone to sleep...even Russell. This book brought a smile to my face! It was a cute book and fun to read. Russell the Sheep is definitely a lower grade and age reading level. I say this not necessarily because it has easy Russell the Sheep has a hard time falling asleep. He tried all sorts of methods, like covering his eyes, taking off his fur and then putting it back on. He tried different places to rest but none of his efforts seemed to work. However, there is one classic method that can put anyone to sleep...even Russell. This book brought a smile to my face! It was a cute book and fun to read. Russell the Sheep is definitely a lower grade and age reading level. I say this not necessarily because it has easy to read words but rather for the bedtime story feel it has to it. Also, the concept is not hard for kindergarten through second grade (or above) to understand. I would definitely use this book in a kindergarten classroom. It would a perfect book to read right before nap time or for counting. I love Russell. What a cutie-pie. Poor little thing just wants to go to sleep but he can't. He tries all sorts of things. I also love the little frog and ants and of course the other sheep. They all have their individual activities. One likes to knit, a scarf, from another sheep's wool. When they go to bed one has a teddy bear and others have blankets. Maybe they made them from some other's wool. The illustrations are wonderful. Russell the Sheep can't go to sleep. He tries everything, until he counts sheep, and falls to sleep just as everyone else wakes up. The illustrations are hilarious and little ones are sure to relate to Russell's frustration. Russell is a sheep who lives in Frogsbottom Field, and after a tiring day of doing sheep things, all the other sheep went fast to sleep, but Russell was wide awake. He tried everything he could think of to fall a sleep. His only solution was to count things. I quickly rushed through it because it was short. Good book to put your three year old baby to sleep with!!! Poor Russell the sheep can't sleep....so he counts sheep! Lol! Cute story. I like the pictures, but they are a little too dark for holding up at a storytime. It is a good snuggle time read. There's nothing more soothing than trying to sleep with a sheep, specially one as fluffy as Russell. The story is short but quite lovely. Too Adorable! A sheep who can't fall asleep! I like the rhyming of this book the most. However, the ending was not my favorite. Cute story - especially for bedtime. (Similar to Goldilocks) Illustrations are darker - may be hard for larger groups to see. A really cute bedtime story. I love the little sheep laying with their feet in the air. I checked this out from the library. I enjoyed the story. However, for me the most interesting part was that someone modified the book to include. sign language signals. 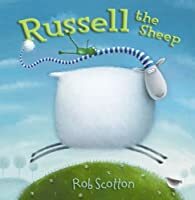 RUSSELL THE SHEEP, an adorable book about an adorable sheep named Russell. He lives in Frogsbottom Field. It’s been a long and busy day in Frogsbottom Field. Grandma sheep’s been knitting. The cuddly flock has lazed and grazed. Everyone’s down for some oh-so-restful zzzz’s …. except for Russell. Is it not dark enough, he wonders? Down goes his woolly hat over his wide open eyes but – oooooh!… the really dark really scares him! Is it too hot? 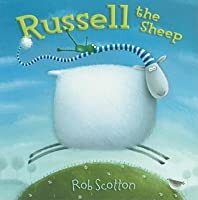 Off comes his lovely woolly s RUSSELL THE SHEEP, an adorable book about an adorable sheep named Russell. Is it not dark enough, he wonders? Down goes his woolly hat over his wide open eyes but – oooooh!… the really dark really scares him! Is it too hot? Off comes his lovely woolly sheepskin (looking SO dapper in dotted undies) but – brrrrrr!… – the night is VERY drafty! Perhaps a new place? Ugh! – the trunk of a car is too cramped! The hollow of a tree is too creepy. The bird-covered branch is way too crowded! What’s a sheep to do? Goodness, is there anything left to count? There is. Something very important that Russell forgot. The whole book will make you chuckle (the illustrations alone make it worth the while) and you will at last…see Russell …..yawn…….get his share of ……zzzzzzzzzzzzzzzzz…. Good night, Russ. You’ll be waking up to five bright and twinkly stars from me, your new best fan forever….. I didn't know this was Rob Scotton's first picture book before I picked it up. I've been reading his Splat the Cat books. I just thought I'd should try his Russell the Sheep books too. They're just as cute as Splat! Russell has a lot of trouble getting to sleep. He tries all sorts of things to make himself go to bed. Finally he decides to count things, but it's not until he starts counting sheep that he finds something to make him sleepy. This is a really cute book for kids who are having trouble going to bed. One of my favorite things about children's books is that they take situations children may find themselves in and make them understandable. They can send a message through childish humor and adorable illustrations. I think that's why I like to read them so much. I love the art and the simple messages. Hopefully, when I have kids I'll know just the book they need. My little rambling bit aside, let me just say I love Rob Scotton. His art is great. I love the way he makes Splat and Russell look so fluffy. It's so cute! I'll be looking out for more Russell the Sheep. Scotton, Rob. (2005). Russell the Sheep. New York, NY: Harper Collins. Annotation: For preschoolers to first graders. In this story, Russell is the only one in Frogsbottom Field who cannot fall asleep. He tries several things to help him fall asleep and finally he begins counting things: his legs, the stars, and even sheep. Younger readers will relate to this book because they too may have trouble falling asleep at night. Additionally, young children can count along with Russell, pointing to eac Scotton, Rob. (2005). Russell the Sheep. New York, NY: Harper Collins. Annotation: For preschoolers to first graders. In this story, Russell is the only one in Frogsbottom Field who cannot fall asleep. He tries several things to help him fall asleep and finally he begins counting things: his legs, the stars, and even sheep. Younger readers will relate to this book because they too may have trouble falling asleep at night. Additionally, young children can count along with Russell, pointing to each leg and sheep to help them develop their one-to-one correspondence. Scotton’s humorous illustrations use calming colors and shapes. Furthermore, the book interacts with the young readers as they look for the funny frog on each page. Personal Reflection: I like this book because children love stories that they can relate to. However, I do not think this is the best book for teaching numbers or counting. The numbers are written only in words, it would be effective in teaching numbers if it also had the number symbols. On the other hand, this book is exciting and engaging for young readers and there are endless possibilities for story extensions. This book could also be a great way to introduce problem-solving techniques to younger children. Mom's Review: The artwork is worth the price of the book alone, I dare you not to fall in love with his adorable face. The prose is simple, sweet and the storyline perfect for the young and old alike, as we have all suffered the difficulty of not being able to get to sleep. Russell has a charming personality and kids will enjoy his silly antics & maybe at the same time learn some ways of helping them get to sleep -- if they can stop giggling that is. This one is a must for all parents and ab Mom's Review: The artwork is worth the price of the book alone, I dare you not to fall in love with his adorable face. The prose is simple, sweet and the storyline perfect for the young and old alike, as we have all suffered the difficulty of not being able to get to sleep. Russell has a charming personality and kids will enjoy his silly antics & maybe at the same time learn some ways of helping them get to sleep -- if they can stop giggling that is. This one is a must for all parents and absolutely perfect for story-time at school or the library. A classic I tell you. Jake's Review: Russell is hilarious and I understand what it feels like to not be able to get to sleep. The pictures are cute and it is a very easy read. I think Jesse would like the pictures, if he can sit still long enough to look at them - I think that midget has ants in his pants. Maybe I will get him some more Russell books, mom says there are a few others. It started out all right. I was expecting more because I'd liked the other Russell book so much. (I tend to like sheep books even more because of Mom anyhow!) It wasn't great until at least halfway through. Then I very much enjoyed it. Of course, I loved the pictures throughout. There's humor as long as you choose to see it, and choose to laugh at it. 2/6/13 & 2/7/13: I put this in the "comfort" theme, mostly because I brought Shaun the Sheep in as the comfort toy object, and Shaun and Russel It started out all right. I was expecting more because I'd liked the other Russell book so much. (I tend to like sheep books even more because of Mom anyhow!) It wasn't great until at least halfway through. Then I very much enjoyed it. Of course, I loved the pictures throughout. There's humor as long as you choose to see it, and choose to laugh at it. 2/6/13 & 2/7/13: I put this in the "comfort" theme, mostly because I brought Shaun the Sheep in as the comfort toy object, and Shaun and Russell could be brothers. Both groups seemed to like the book, but they definitely missed a lot of the humor--either because it was over their heads or because the details in the pictures were too small for them to get in ST setting. But it worked, and they got the ending and smiled.